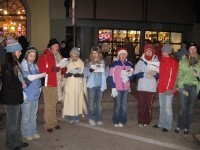 Tonight, Thursday, December 6th , is the ninth annual Winter Walk. The official events run from 5 to 9 pm and the subsequent socializing can last until, oh golly, maybe even 10 pm. This year’s activities include Santa’s Elves giving out candy canes, the Northfield High School Drummers, Caroling by Northfield Middle School Choirs, Hot Cider and Cocoa by the Girl Scouts in Bridge Square, the Magic of Model Trains in the Historic Carnegie Library, Caroling by the Bethel Lutheran Church Choir, Caroling by I Cantanti, Dance Performances by the Northfield Dance Academy, Caroling by St. Dominic’s School, Caroling and Dance Performances by Just for Kix, Frosty the Snowman and Rudolph the Reindeer, Caroling by Laura Baker Services Association, the Festival of the Trees at the Northfield Arts Guild, Caroling and Dancing by the Hiliners, Caroling by the St. John’s Lutheran Laudate Choir, Music Performances at the Northfield Arts Guild and Caroling by the Madrigal Singers. Of course, it wouldn’t be Northfield without the James-Younger Gang, posing with Royalty at the Northfield Historical Society. Then there’s the whole holiday shopping thing. Downtown Northfield has over four dozen retail options, locally owned by folks with creative gift ideas and over two dozen dining options, if you need to refuel for another lap up and down Division Street. The Winter Walk is sponsored by the Retail Committee of the Northfield Area Chamber of Commerce. Thanks to their Executive Director, Kathy Feldbrugge, for the picturesque dusting of snow. Oops, I missed the “Various Ensembles from the Northfield High School Band” at Quality Bakery.